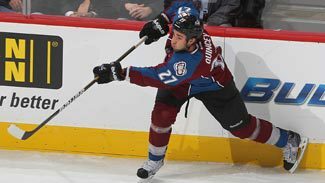 CENTENNIAL, Colo. -- It seemed so fitting when Kyle Quincey completed the Colorado's improbable rally from a three-goal deficit Thursday night with an overtime goal to give the Avs a rousing 4-3 win against the New York Islanders. 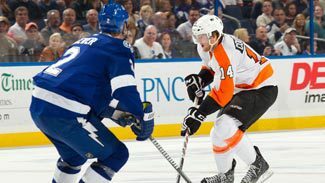 The 26-year-old defenseman is enjoying quite an individual comeback season after missing the final 55 games of 2010-11 to recover from a left shoulder injury that required surgery and had him wondering if his hockey career was over. "I had a fear of retiring," he said after practice Friday. "It was really scary." Quincey suffered the injury in a Dec. 11 game at Washington after he put a hit on Alex Ovechkin in retaliation for one against Avalanche center Matt Duchene. "First shift of the game," he said. "Ovechkin ran Dutchie pretty good and I took exception to that. He had his head down and I went to hit him and it didn't end up too good. I landed pretty badly on the ice and it popped out and I went into the boards. I did (hit him), but I got the worst of it." The shoulder was dislocated and a nerve under his armpit was stretched to the point where Quincey lost some feeling in his arm and could barely lift it. Doctors had to wait a month before performing the surgery. Turns out, the operation and plenty of hard work in rehabilitation have paid off. Quincey has been able to raise his arms after scoring a goal three times this season, and he's among the NHL's top-scoring defensemen with 12 points in 16 games. "He's been real good since the start of the year," Avalanche coach Joe Sacco said. "He missed a lot of time and usually it takes guys a little while the next year to catch up to speed. He hasn't missed a beat. He's being used in all different situations -- the power play, he kills penalties, he plays against top lines -- he's been real, real steady for us, real solid. He's off to a real good start." At 6-feet-2 and 207 pounds, Quincey has good size to go along with his mobility and hard shot. He's been quarterbacking the first power-play unit and has scored all of his goals with the man advantage. He's off to his best start since 2008-09 when he finished with four goals and a career-high 38 points for Los Angeles. The Avalanche acquired him on July 3, 2009 in a deal that sent left wing Ryan Smyth to the Kings. "(Colorado) has shown a lot of faith in me and I'm trying to show them that they're making the right decision," said Quincey, who's averaging just under 23 minutes of ice time per game and is tied with Duchene for the team scoring lead. "We have so much skill up front that it's fun to be out there. Just give the puck to those guys and watch them do their job." Quincey had a career-high six goals to go along with 23 assists, 76 penalty minutes and a plus-9 plus/minus rating in 2009-10 when the Avalanche made the playoffs. He struggled at the start last season with one goal in 21 games before suffering the injury that ended what turned out to be a nightmare season for him and the Avalanche. "Going back to when he was healthy the first year I was here – his first year, too – he was really good for us that year," Sacco said. "He's a little bit older now and he understands the game a little bit more. He's playing as a complete defenseman." Quincey has been paired with Shane O'Brien, a physical 6-3, 230-pounder, in recent games. It didn't take long for the two to become acclimated to each other's style of play. "We communicate well and we read off each other," O'Brien said. "I played against him in junior and saw him come up (to the NHL). He's big, he's skating, he's shooting and he's passing. He's got all the skills you need and he plays with an edge. Offensively he's doing a great job for us five-on-five and on the power play, and defensively I think we've been pretty solid. "It's never easy coming back from an injury like he had, so you have to give him credit. He put in the work this summer and he came to camp in good shape and ready to go. It's showing on the ice." Quincey said he felt more like a cheerleader than a player while he was recovering from surgery as the Avalanche floundered in the second half of last season and skidded into 29th place in the overall standings. "I came back very hungry," he said. "Any time you miss that much time and you watch your team go through what they did last year, it's the hardest thing. I don't wish it on anybody. I'm so happy to be back right now, being healthy and being able to help the team. Things are going in for me now and I'm just going to keep shooting the puck and hopefully it keeps going."